Hi, readers, we have wonderful news for you. The applicants who are seeking Latest SSC Jobs they have the great opportunity as Staff Selection Commission has issued the notification to hire 2020 Junior engineers. The advertisement is regarding SSC JE Recruitment 2019 for 2020 Vacancies. 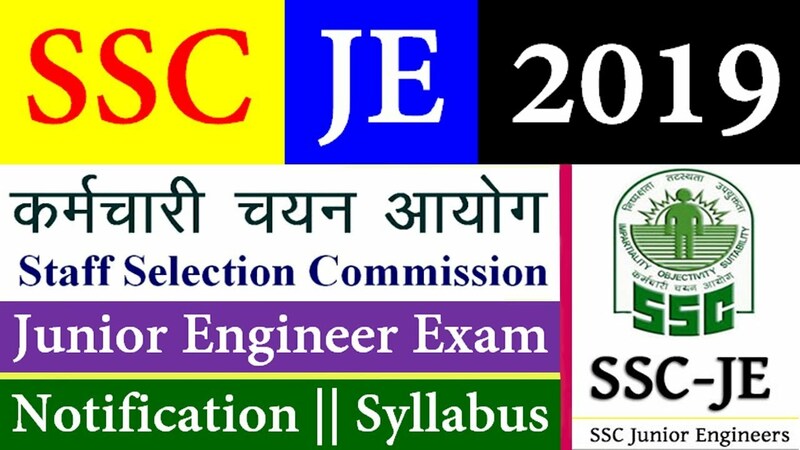 Candidates who are interested and eligible for this recruitment drive, they can apply for SSC Junior Engineer Recruitment 2019 for 2020 Vacancies from official website i.e. http://ssc.nic.in. We have uploaded the Recruitment Notification. The applicant can read the official thoroughly before filling the SSC JE online application form 2019. Applicants can fill their online forms from 1st February 2019. The last date to fill the online application form is 25th February 2019. Furthermore, complete details link education, age limit, selection process etc are given below. Educational Qualification:- Candidates who are going to apply for SSC JE 2019 Application Form, their minimum education should possess Diploma/ Degree in the respective field from State/Board/Govt from the similar post. For more details, candidates may download official notification for more details. Age Limit:- Candidate’s age should more than 18 years per official notification. Moreover, age relaxation for SC/ST/OBC will permissible according to govt norms. Application fee: Rs.100/- for General and OBC. Other candidates are exempted to pay any application fee. Eligible and interested candidates may submit their application form from 01-02-2019. Candidates Should Register Themselves and then Can Apply Online. Candidates Should Retain The Registration Number Assigned To Them Online And Details Of Payment Of Fee For Further Correspondence With The Commission. Candidates can Apply Online from 01.02.2019 To 28.02.2019.